It's been a while since I posted any pictures here but I thought you may like to see this one. Summer long project just finished and delivered today. One of the nicest paint colors I have done yet. I like it, I hope you do too. See ya all later. Have a good day. WOW! Museum quality paint job! Wish I had someone around here that could do a paint job like that! Just beautiful! That is absolutely beautiful. Who did the paint job and is all that airbrushed accents or taped off and painted? Wow!!! I can see why it took all summer!!! A+ all the way!!! I'm not usually a fan of pumps with bling, but that thing looks incredible. I like to detail the inside a little too. Looks incredible, wish you were closer. I like original pumps, but that is an absolutely amazing paint job that suits the pump. You have created a true work of art. Looking for Canadian Imperial and Canadian North Star. Very nice...could you show us a close up on the lettering as you did in the 'before' pic? I agree... some of the nicest color choices I have seen - makes the pump look classy! Did you have to lay a clear coat over everything to fill in the "ridges" from the masking tape? 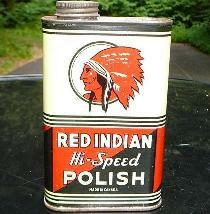 Always looking for Red Indian Tins, McColl Frontenac, McColl Bros., Buffalo (prarie cities oil co), Stellarene and other western canadian tins.